THE AUGURIES for next week’s Brexit votes are not good, to put it mildly. The European Reform Group of hardline Eurosceptic MPs is divided into two camps: those who are willing to compromise with the prime minister on condition that they get everything they want; and those who are not willing to compromise even if they get everything they want with a cherry on top (one Leave-supporting politician I know tells me that about 30 of his colleagues are now clinically insane). The DUP, Northern Ireland’s largest party, is in high dudgeon—or perhaps I should say even higher dudgeon than usual—about being disrespected. The Labour Party shows no signs of putting country before party. So it looks as if we’re heading for yet further paralysis. The prime minister will suffer a heavy defeat in Tuesday’s vote on the withdrawal deal; parliament will vote against a “no deal” Brexit on Wednesday; and then, on Thursday, it will vote to extend Brexit. With no clear plans about what to do with this extension, Britain will have set itself up for another period (length to be decided) of paralysis and drift, culminating in another cliff edge. A particularly distasteful form of Groundhog Day. The prime minister’s only chance of breaking this logjam is to do something dramatic. Here’s one idea: offer to resign from the prime ministership with almost immediate effect if parliament votes her deal through. She could say that she will regard her job as done if she can get Brexit through parliament. It will then be up to her successor to guide Britain through the immediate post-Brexit maze. She could add that, if parliament can’t make up its mind, she will have no choice but to stay on for one more heave. This might just have the effect of shocking enough MPs to rally behind the prime minister. Conservatives would rally because they’re desperate to give someone else a chance. A significant number of Labour, Liberal Democrat and Independent Group MPs might also rally because they would be confronted with someone who was visibly putting the country before her career. Rather than “salvaging” a Tory Brexit, Labour MPs would be waving goodbye to a Tory prime minister. 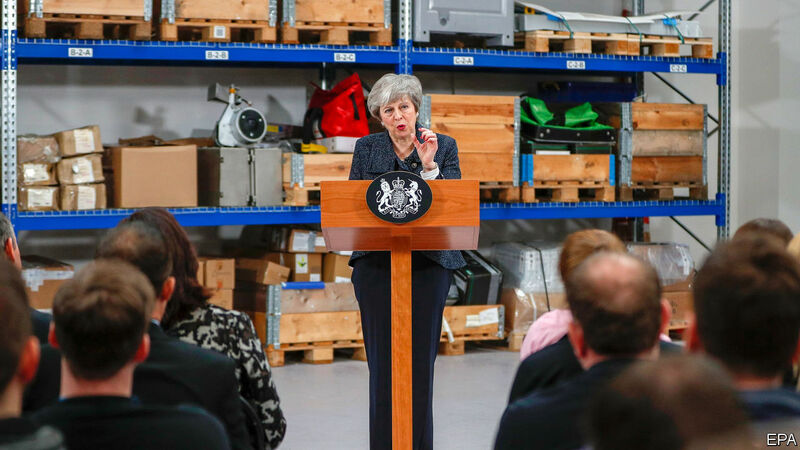 Wavering MPs of all parties would realise that they face a stark choice: do they want more months of the prime minister robotically repeating the same stock phrases or do they want to shake things up? This would do wonders for Mrs May’s reputation (remember she’s promised not to lead the Tory Party into the next election). Rather than being remembered as the woman who “lost” the 2017 election and bungled the Brexit negotiations she would be remembered for sacrificing herself for the country—and for making one of the most dramatic gestures in British political history. A day of heroism would help to cancel out months of dithering. It would do wonders for the Tory Party, which would then be able to choose between a collection of perfectly competent successors, such as Sajid Javid, the home secretary, and Jeremy Hunt, the foreign secretary. It would be able to clear the Cabinet of the dead wood that has accumulated there under Mrs May, particularly Chris Grayling, the transport secretary. It would be able to shift its focus from delivering Brexit to repairing the country (though Brexit negotiations will be going on for years, they will be more technical and less headline-grabbing than the current round). Both parties are in such a dismal state that the one that tries to fix itself first by getting rid of its current leader and bringing in a new generation of talent will have a big advantage. A far-fetched suggestion perhaps. But the alternative—a defeat in parliament, more months of negotiation, a crumbling government—is something to be avoided at all costs. I’M FREQUENTLY told that the British don’t do enough to honour their intellectuals. The French revere even the spikiest figures, such as Michel Houellebecq (who most certainly deserves to be revered). The British by contrast would rather give a platform to second-rate comedians than serious thinkers. James Marriott made this point in an article in the Times this week (“Britain should learn to love its intellectuals”). Perry Anderson once wrote a ponderous essay on why the French are so much cleverer than the British because they recognised the genius of Louis Althusser, who turned out to be a wife-murdering lunatic. The BBC’s fondness for second-rate comedians is one of the great puzzles of our age. Radio Four seems to have a slot at 12.30 every day reserved for people who don’t know the difference between being funny and being half-witted. But I wonder about the idea that Britain doesn’t value intellectuals. The British have built palaces for at least some of the most prominent examples of the species in the form of Oxford and Cambridge colleges. The “smart thinking” sections of bookshops are bursting with volumes, some of which do exactly what is on the package. John Gray, who is undoubtedly an intellectual, and a delightfully gloomy one at that, enjoys a prominent platform in British life. Isaiah Berlin, Mr Gray’s tutor, was loaded down with honours, including a knighthood and the Order of Merit, for being such a brilliant writer and talker. NOT that all intellectuals are worth paying attention to. It’s impossible to look at the intellectual enthusiasms of the decade from the mid-1990s to the mid-2000s without a sense of embarrassment. Almost every so-called big idea that seized the imagination of the era—from the wonders of Silicon Valley to the wisdom of crowds to the inevitable triumph of liberal democracy—turned out to be tosh (I write this as someone who contributed to this tosh myself). We were told that Silicon Valley would produce a new, free-wheeling type of capitalism that would put the world’s knowledge at our fingertips. Now the valley is governed by a collection of corporate giants that are essentially in the advertising business, subordinating knowledge to the great calling of selling us stuff. We were told that crowds were the repositories of all wisdom, and that experts should bow down before the all-knowing people. Now we see populist rage destroying our institutions and debasing our civilisation. I spend as much time as I can at the moment reading things written in the mid-Victorian era—particularly the 1860s—because the mid-Victorians were grappling with the collapse of Benthamite liberalism in much the same way that we are grappling with the collapse of neo-liberalism. I’m struck not only by how good books like Matthew Arnold’s “Culture and Anarchy” (1869) and John Stuart Mill’s “The Subjection of Women” (1869) are, but how directly they speak to our own time. I wonder what readers will think, 150 years from now, when they read Tom Friedman’s “The Lexus and the Olive Tree” (1999) or James Surowiecki “The Wisdom of Crowds” (2004). Previous PostPrevious When can governments revoke citizenship?